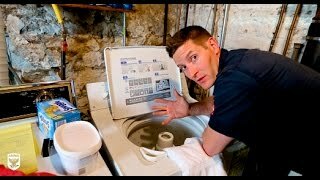 Tools | AMMO AUTO CARE INC.
How do I wash my microfiber towels? This video is a step-by-step guide for washing and maintaining your car care towels. This is a very important (yet overlooked) process necessary for properly detailing your car. 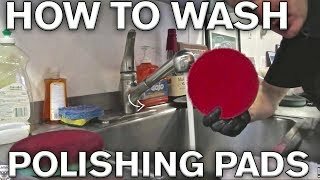 How do I wash my microfiber cutting and polishing pads? Having extremely clean pads is vital during the restoration process, so frequent cleaning of the pad itself is crucial. The video below explains how the clean your pads effectively. What are the best car detailing shoes? Yes, this is weird question…but I get asked this at least once a week. I LOVE LOVE LOVE the Salomon Men’s Speedcross 3 Trail Running Shoe. Best shoe I’ve ever had. Warning: This is the “race car” of shoes. What do I mean? They are amazing when you are using them during the race, but they require replacement more often than normal shoes. I go through a pair every 5 months and I’m ok with that. I want the best, and once they’re no longer comfortable, I get a new pair. (I typically buy 2 pair at a time and store the 2nd in the closet) The rubber sole is extremely soft and will wear-down quicker than any normal “street car” shoes. Did you get the pun? Here is an AMAZON link if you are curious enough to see my moon-boots. What is the 2 bucket method of washing? 1) Bucket #1 is filled with AMMO Foam and water (grits guards as well). 2) Bucket #2 is filled with only water. 3) The wash mitt from bucket #1 is used on the paint and collects dirt. 4) The dirty wash mitt (after every panel) is dunked in bucket #2 and shaken to release the trapped dirt. 5) The now clean wash mitt is dunked in bucket #1 again to reapply the soap.